Every time I’m invited for a Shabbat meal, I notice that the host dips the bread into salt before serving it. At first I thought it was just a flavor thing, but then I saw it done in multiple homes. What’s the reason for this? Nevertheless, the custom is to always dip bread into salt—not only on Shabbat.2 Why? In describing his vision of the altar to be placed in the Third Temple, Ezekiel says, “The altar was wood, three cubits high and two cubits long . . . and he spoke to me, ‘This is the table that is before the L‑rd.’”3 Note that the verse starts off calling it an altar, but then refers to it as a table. So next time you wash for bread and are waiting to eat, take a look at your salt shaker and remind yourself of G‑d’s eternal covenant with the Jewish people. Even as you sit momentarily bereft of mitzvahs, the salt brings attention to the fact that G‑d’s pact with Israel will last forever. Talmud, Berachot 40a; Shulchan Aruch, Orach Chaim 167:5; Shulchan Aruch HaRav 167:8. Shulchan Aruch, Orach Chaim 167:5. Shulchan Aruch and Shulchan Aruch HaRav loc. cit. Arizal in Shaar HaMitzvot, Parshat Eikev; Kaf HaChaim, Orach Chaim 167:37. Arizal in Shaar HaMitzvot loc. cit. ; Shulchan Aruch HaRav and Kaf HaChaim loc. cit; Ba’er Heitev on Shulchan Aruch, Orach Chaim 167:5. See also Likkutei Torah, Parshat Vayikra, discourse entitled Lo Tashbis, and Sefer HaMinhagim Chabad. Midrash, cited in Tosafot, Berachot 40a; Beit Yosef on Tur, Orach Chaim 167; Magen Avraham on Shulchan Aruch, Orach Chaim 167:14; Shulchan Aruch HaRav 167:8. 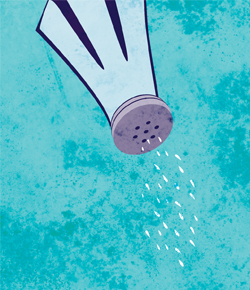 According to this custom, it is important to place salt on the table, even if no one will partake. See Sefer HaSichot 5749, vol. 1, pp. 337–338. Additionally, another characteristic of salt is that it corrodes. In this context, that would refer to the destruction of negativity. See Sefer HaSichot, loc. cit. ; Isaiah 51:6 and commentaries there. See also The Kabbalah of Salt. Why Is Kiddush Said Over Wine? salt, Pesach matzoh and Shalom I was told that we do not need to dip challah in salt because salt was already added before baking, and that Pesach matzoh will not have had it added before baking so we need to be careful to dip during Peach. Not having to dip challah because it is already tasty is a different perspective. I was told that the purpose of dipping was to express Shalom among those sitting down to eat, and refusing to dip was refusing to wish or extend Shalom to others. Thank you for this lesson! It's such a shame modern life is forgeting rituals, and their meaning! This is precious enlightment.